A friend showed me a Jack Best gun he had with an unusual CF conversion set to it. It had a 45 case necked down to 38 cal. The frame and magazines were all 45 setup and only the top was changed to get a CF rig. 3.5 of BE was used. Ever hear of it? I had not. 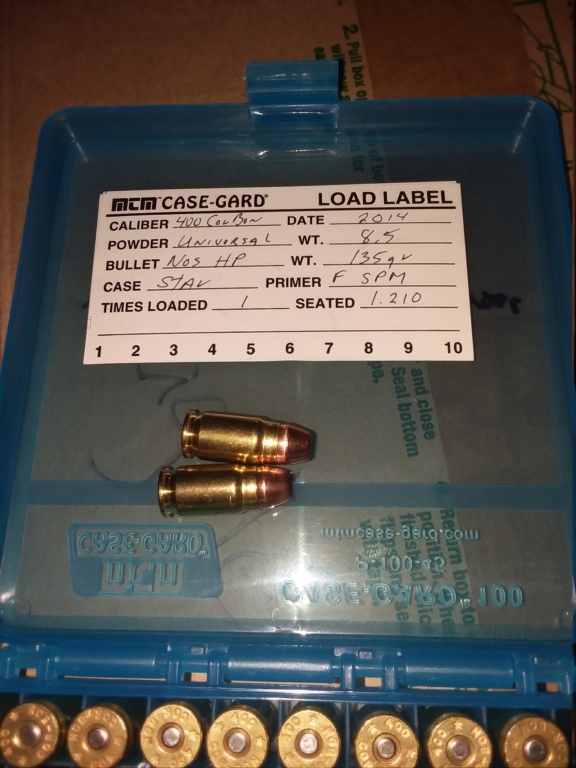 Found this on one of the other forums: "The conversion was sold but Whitnew sales of Calif. back in the 70 and 80 it took a 45acp case and neck it down to 38 and you could use the same 45 mag, if anyone seen one with form dies I would like to know. Had one years ago and it shoot great but hard to make brass." I remember some articles about the conversion back when. Never really caught on. I shot with a shooter in mobile back in the 80s that used one. Kool, easy to shoot. He was a good master shooter. I did have a round he gave me. There is a modern day choice that comes close. The 400 Cor-Bon is a 45 necked down to 40 cal. Designed to be a magnum 40 cal but has the potential to be a real mild cf. Magnus has two SWC bullets for it the 105 which mimics a conventional SWC or a lighter RNSWC that feeds easier. It is easy to size brass and easy to find barrels. It is real important to get and use a factory crimp die if you decide to play with one. These are a tiny teeny bit hot but only ones I had a picture of. 105 swc at ludicrous velocities for falling plates. wonder how they compare to a 41AE? bruce martindale wrote: A friend showed me a Jack Best gun he had with an unusual CF conversion set to it. It had a 45 case necked down to 38 cal. The frame and magazines were all 45 setup and only the top was changed to get a CF rig. 3.5 of BE was used. Ever hear of it? I had not. When I started in BE. maybe 2-3 yrs ago (?) a friend showed me a 38-45 case left from his conversion. The discussion was the result of my mentioning an article re: the round in a gun mag. No recollection as to the mag but the articles was circa 1963. The round was referred to was the .38-.45. The article claimed 1800 fps w/a full load. My friend, Miles had bought it in Cal and used it on woodchucks in Ohio later. He said the round's intended use (one of?) was for CF. Used the standard 1911 mags and was an improvement on the .38 conversions. He had sold or traded the conv. some yrs before but said he might have a couple cases. With his usual remark "all this horses--- there has to be a pony somewhere!." I have the case if anybody wants dimensions. lyman1903 wrote: wonder how they compare to a 41AE? Hmmm, is the 41AE in the same class as a 41 Mag? If so, I'm not sure I'd want to be shooting it in a sub 2 lb semi-auto! Or is that for use as LenV's cure (IIRC) for a flinch: shoot a hand cannon and the wimpy 45 won't bother you at all!